This year my school, Southfield Christian is implementing a 1:1 iPad program in the high school. Staff were given three days of training in the spring before summer vacation and were instructed to play with and use their iPads throughout the summer months. Because my schedule is somewhat flexible this year, my goal is to work individually with teachers on creating lessons and activities that fully use the capabilities of the iPad. These activities play into my longer-term goal of becoming an Apple Distinguished Educator. This past year opportunities have opened up for me to do some training and consulting work related to educational technology. I've enjoyed the opportunity to visit schools around the country, meet new people, and share my experiences with technology in the classroom. This year my goal is to launch my consulting website where I can highlight my experiences and share the resources that I have created. 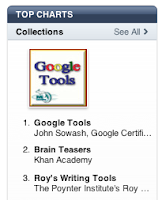 Over the summer I was shocked to learn that the Google tutorial screencasts that I created were the #1 series on the iTunesU Teaching and Education section. I even beat out the Khan Academy! Obviously there is a demand for these brief tutorials so I would like to add to my collection. My goal is to add 15 new tutorials this year. If you have any requests, let me know! Over the last few years I have built a very wide-ranging professional learning network. While variety is good, I'm also beginning to feel the need to focus my PLN in terms of subject and quality. At the risk of sounding harsh, there are a lot of talkers but few doers on the web. See my previous post on "Shipping" to better understand where I'm coming from. This year I will be weeding out the "talkers" and those who primarily post outside of my current areas of focus: ipads in education, online learning, and Google Apps for Education. This is the toughest goal on my to-do list. I do not have the required skills to build an mobile app however I am fortunate to have a brother in law who is full time programmer with mobile app experience. I have a couple of ideas for apps which I need to explore in more depth. I'm putting this goal down because unless I do, I will never get it done! Those are my five goals for the year. I would be delighted to read your goals. Leave me (and everyone else) a comment with a link to your post. John!! You're going to build a mobile app? You truly impress me. Thanks for making time to help the rest of us with our iPads. We're lucky to have you at SCS :).